Today’s craft project is inspired by MacKenzie-Childs. You may have heard of them? They are known for their imaginative, whimsical designs of home decor, dinnerware, and home furnishings. A few of which I have been gifted over the years, by my generous Mother In-Law. Thanks Barb! I really love their off beat charm. We are going to make a distant cousin variety of M-C’s Cookie Jar, using a few decoupage ideas we have up our sleeves. The company’s HQ is a gorgeous Victorian farmhouse, barn and property in Upstate New York, complete with farm animals, gardens, and views of Cayuga Lake. Free tours are open to the public. Ahem, bucket list! Mackenzie-Childs describes their style as tradition with a twist, quirky, happy and inspiring. They had me at quirky. 😉 Designers and artisans create their signature hand-painted wares. Read about their story and product lines at mackenzie-childs.com. 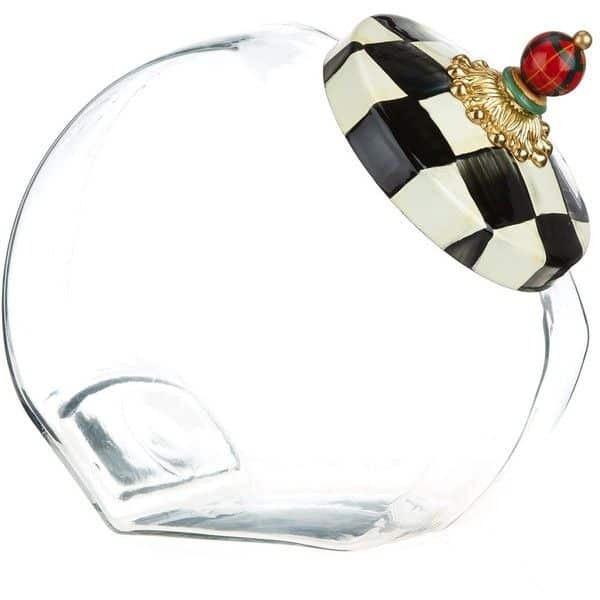 My absolute favorite MacKenzie-Childs product is the Cookie Jar with the Courtly Check Enamel Lid, above. I keep it in the kitchen filled with grab and go snacks. It’s functional yes, but honestly I just love the charm it adds to the room. Feeling inspired, I wanted to try to create my own, smaller version of the cookie jar, the penny candy jar. I invited friends, Amy and Deb to join me and try to make one too. We decided on decoupage instead of paint. Decoupage would be faster, easier and more forgiving. Hopefully? According to Merriam-Webster, découpage is the art of decorating surfaces by applying cutouts (as of paper) and then coating with usually several layers of finish (such as lacquer or varnish). 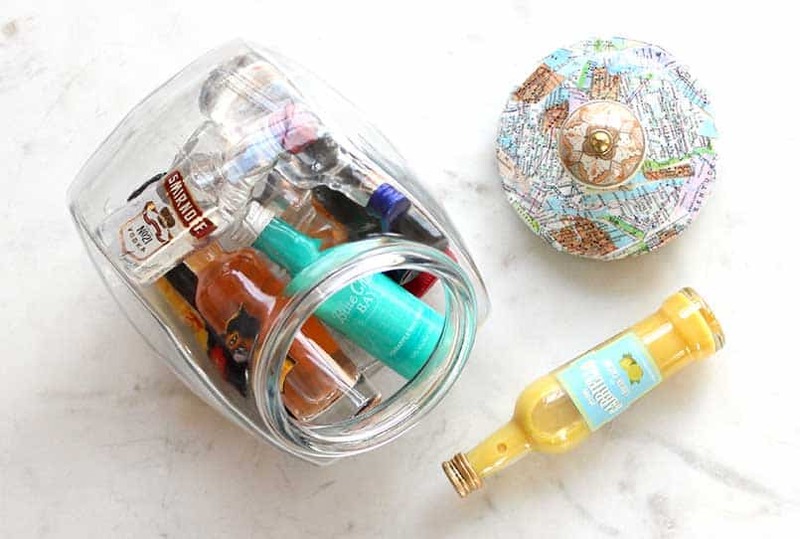 This craft does not require many supplies and all are fairly easy to find. I bought the Modge Podge, which is a brand of decoupage glue, and the penny candy jars at Target. 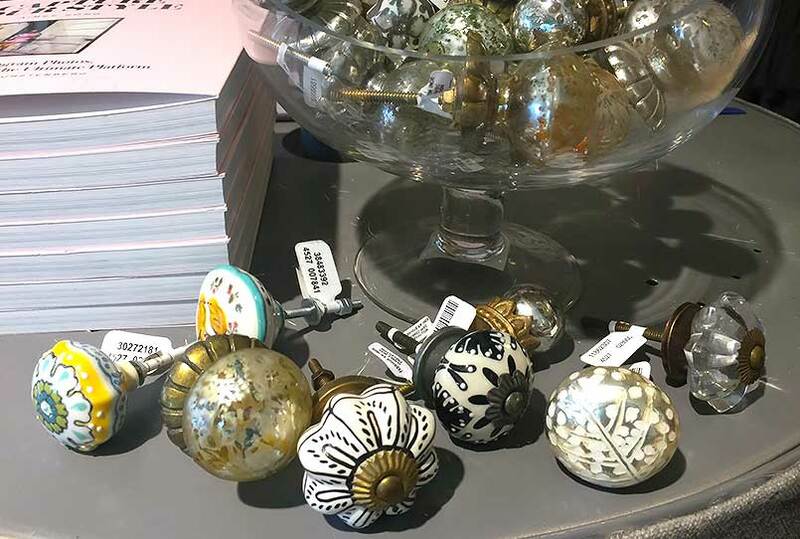 I especially enjoyed shopping for decorative knobs. There were so many great options to choose from. Anthropologie has thee most beautiful varieties. Wow! I could not decide. Suddenly I wanted to dream up other projects that required more knobs …? 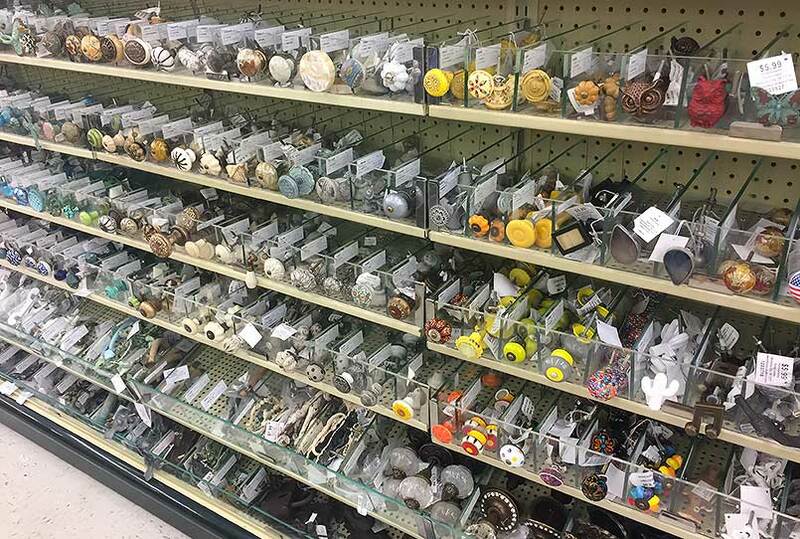 Hobby Lobby also has a large and diverse collection, and theirs are less expensive than Anthro. I asked the girls to bring their own selections for the decoupage papers; wrapping paper, scrap-booking paper, tissue paper or anything else they thought would work. Here are the materials we used. This was the first time any of us had decoupaged. It was fairly fast. There were some lumps and bubbles for sure. We learned a few things in the process we would change next time. I’ve added both instructions from the Mod Podge website and additional tips below. 1 Remove the original knob. 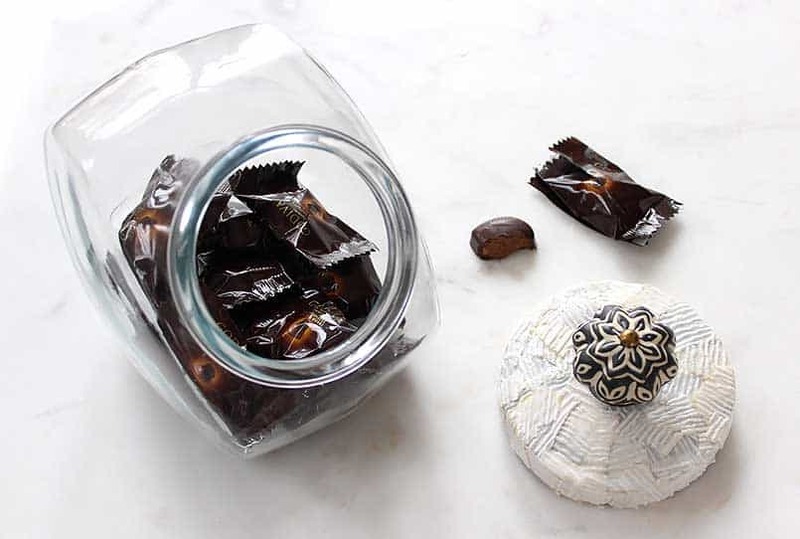 Make sure the jar lid is free of dust and dirt. One option, is to base coat your surface with spray paint. (If you do not want to paint it, skip to step 2) If you do paint it, consider roughing up the lid surface slightly with a fine sandpaper. Very lightly, so the paint has something to “grab” onto, but not too visible. You don’t want to see the scratches. Make sure the paint has dried completely before moving on. If you feel any tackiness or can see an imprint of your finger if you press on it, it’s not dry enough. 2 Pick your Mod Podge formula. See the Mod Podge website for information of finishes. 3 Prepare Items to be Mod Podged. Here a few tips you should know before beginning. Paper – Most items, especially thicker papers and scrapbook papers, are ready to be Mod Podged as is. If you are working with thinner sheets of scrapbook paper or inkjet printouts, it may help to spray your paper with a clear acrylic sealer before Mod Podging. Spray both sides and allow to dry before using. Tissue Paper – There is nothing that you need to do to prepare tissue paper, but just be advised that because it is so thin, it is very difficult to Mod Podge without wrinkles. The good news is that wrinkles are typically part of the charm of using tissue paper and add a little character to your surface. Mod Podge tissue paper carefully so that it doesn’t tear. Cut out your paper or whatever it is that you are planning to decoupage. Experiment with design elements to determine the layout of your piece. Add interest to your design by using large and small pieces, layering and overlapping elements and coordinating colors. 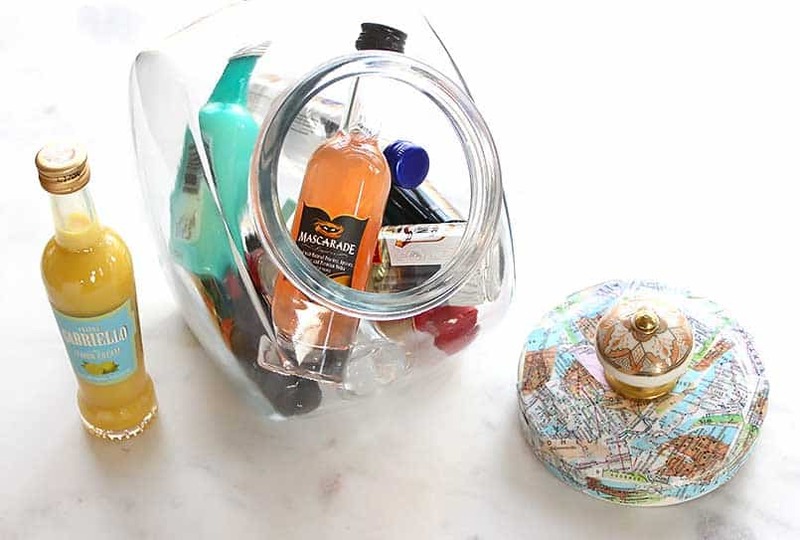 4 Cut your items to fit your surface. Measure as necessary, with a ruler and a pencil, and trim your items to fit. You’ll be much happier if you cut everything to fit before Mod Podging as opposed to after. 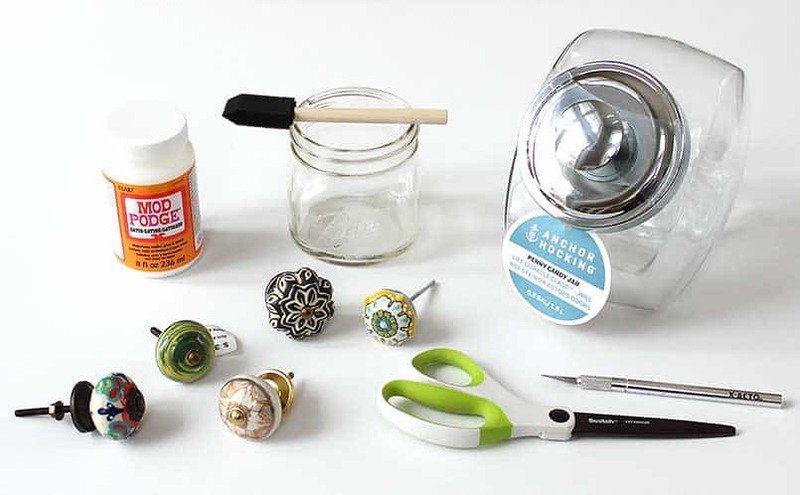 5 Adhere each element with your Mod Podge. Always start with the underlying design elements and work your way upward (when layering). Apply a medium coat of Mod Podge to the surface. 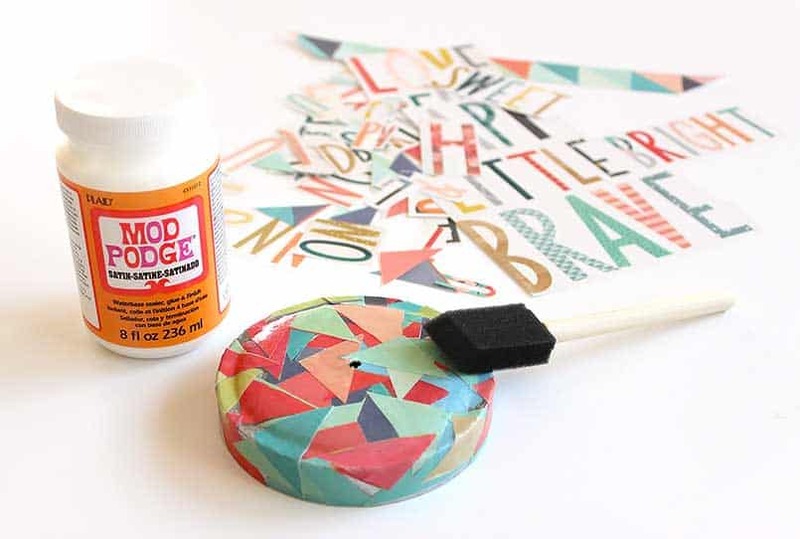 Too little Mod Podge and you will get wrinkles – and you can always wipe away excess Mod Podge. Place your item(s) to be decoupaged on top of the Mod Podge and move onto step six. 6 Smooth, Smooth, Smooth. Keep smoothing until all of the bubbles are removed. Then, AND THIS IS IMPORTANT, let your project dry for 15 – 20 minutes. Don’t put a top coat on right away. Smooth from the center outward. Watch for bubbles as your papers dry. If one forms, use a pin or utility knife to pop it and then use your fingers to smooth it down. 7 Add a protective coat of Mod Podge to your project using a foam brush, sponge or flat brush. Allow to dry and then repeat. The number of coats you finish with is up to you, but we recommend at least two. When you finish, if you experience any tackiness or just want to add durability, add a clear spray or brush-on sealer to the top. Let dry and you’re done! Be patient. Let each layer of Modge Podge dry completely before applying the next layer. As an option, try to tear your papers instead of cutting them. Torn edges may lay a little flatter and blend better. Do a test if you are curious. Consider making and using a photocopy of photos or other important papers. This way you can save the original documents. For a very smooth finish, wet a piece of #400 grit sandpaper with water and sand lightly between coats. Wipe dry and polish with #0000 steel wool on the final coat. 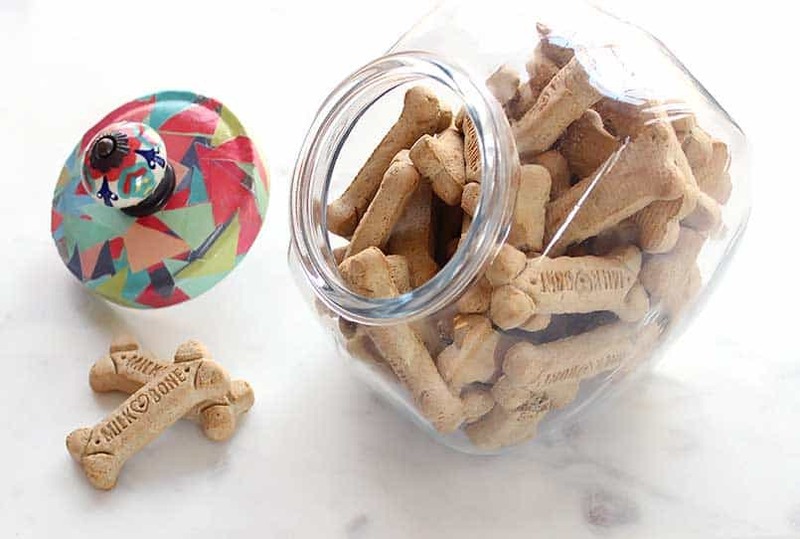 These jars work great for snacks, candy, cookies, mini-bar miniature bottles, cotton balls for the bathroom vanity, clothespins in the laundry room or treats for your four-legged friends. I hope you enjoy making them. If you give this project a try, please upload a picture and let me know how it went.